This campaign was a multi-touch email, direct mail, and tele-prospecting effort. The targets were executives in entertainment companies. We were promoting a product that provided a database service of background on movies, TV shows and music for them to use on their websites and content sites. Since this was a new service being offered by Rovi, it was important to get the executives involved in how the database presents the content. So we created a quick game they could play using brass game pieces we provided in a leather covered box, and challenge questions with answers from the database. The prize for answering a few questions from the database was an iPad. We provided the email, direct mail, tele-prospecting and game website creative for this campaign. 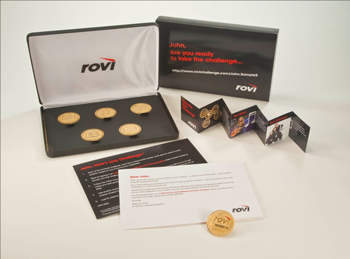 Rovi closed at least two major entertainment company new accounts through this targeted high end campaign. Call and speak with a Beasley marketing expert now. Let us create a winning campaign for you.